Arguably formed in 1901, at the time it was "called into existence" by the Lord Mayor of London ( read below), the S.M.R.C. had its roots in two other civilian shooting associations, the most significant of which was the Society of Working Men's Rifle Clubs founded by Major General Charles E, Luard. Although local and County level rifle meetings were hel previously, the first truly national "small-bore" meeting to be held in the country, at Crystal Palace in 1903, was, according to Ernest H. Robinson ( Capt. - G.M. and, during the World War II period, Editor of the N.R.A. Journal), technically held under the auspices of the S.W.M.R.C., whilst the 1904 meeting, held at Olympia, was the responsibility of the S.M.R.C. Mr. E.J.D. Newitt, in his book " The Citizen Rifleman" published in1906, considered the 1903 meeting to be the first held by the S.M.R.C. Whatever the case, it would be reasonable to assume that some form of transition took place between the years 1901 and 1904. The former society continued in incorporation with the succeeding S.M.R.C, along with the also previously existing British Rifle League. There is little mention of the S.W.M.R.C. subsequently in available records, other than of its recognition as the foundation on which the S.M.R.C. was built. Whatever the precise dating of the Society's foundation, the Centenary of the S.M.R.C. was celebrated, over the Christmas period of 2001-2002, by the N.S.R.A. (the current National Small-bore Rifle Association), into which the S.M.R.C. metamorphosed in November 1947. The early Twentieth Century national encouragement of the populace into rifle shooting was instigated by a number of senior military men, keen senior civilian riflemen and politicians, in particular Lord Salisbury, with Lord Roberts of Kandahar as the prime mover and figurehead. This resulted, between 1900 and 1904, in the aforementioned evolution of the shooting sections of the Society of Working Men's Clubs into the Society of Miniature Rifle Clubs. The perceived need for this was largely as a result of the national promotion of rifle shooting after the Boer War (1899-1902), during which the Boer riflemen employed such effective long range fire with the Mauser rifle. The less well prepared British forces were still using battle technique developed from Napoleonic times and suffered heavy losses as a result. Confirmation of these circumstances can be found in "The Citizen Rifleman"** in conjunction with the listing of those closely involved in the movement at its inception; the Patron, President and Vice President, Trustees, Council and other Officers. with which is incorporated the Society of Working Men's Rifle Clubs and the British Rifle League. Offices : 20 Bucklersbury, London, E.C. Patron : H.R.H. 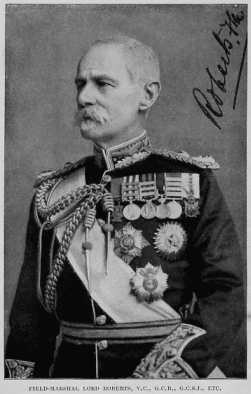 THE DUKE OF CONNAUGHT. President : FIELD-MARSHAL EARL ROBERTS, K.G. THE RIGHT HON. VISCOUNT COLVILLE OF CULROSS. THE RIGHT HON. THE EARL GREY. THE RIGHT HON. THE EARL OF MEATH. THE RIGHT HON. THS EARL OP SCARBOROUGH. THE RIGHT HON. LORD ANNALY. THE RIGHT HON. LORD IVEAGH. COLONEL C. E. WARDE, M.P. His GRACE THE DUKE OF NORFOLK, K.G. His GRACE THE DUKE OF WESTMINSTER. *His GRACE THE DUKE OF NORFOLK, Chairman. * Also Member of the Executive Committee. *MAJOR-GENERAL SIR R. B. LANE. MAJOR SIR W. EVANS GORDON, M.P. *MR. E. J. D. NEWITT. MR. J. ST. LOE STRACHEY. Bankers : LLOYDS BANK, 222 Strand, London, W.C. Auditors : Messrs. CRAGGS, TURKETINE & Co., Coleman Street, E.C. Messrs. HOLLAMS, SONS, COWARD & HAWKSLEY. MACKWORTH B. PRAED, Esq. (Manager, Lloyds Bank), 222 Strand, W.C.
Secretary : Mr. H. MARKS. * Also Members of the Executive Committee. DURING the South African War the advantages of accurate rifle shooting, and the shortcomings in the matter of marks manship of so many of our countrymen who volunteered for service with the emergency forces which were raised at the time, were the subject of universal attention and not a little concern. assailant if he comes but will make the chances of that assailant so bad that no assailant will ever appear." Concurrently, with the great outburst of military ardour created by the war, this speech gave rise to the Civilian Rifle Club movement in England, and simultaneously a similar movement took place on the Continent, in America, and our Colonies. means of attaining the same end. Competent authorities agree that the fundamental principles, if not the entire art of marksmanship, may be acquired by means of low-power rifles on short ranges as well as by higher-power military weapons upon longer ranges, and many influential noblemen and gentlemen, upon the initiative of General C. E. Luard, interested themselves in the formation of this Society with the object of introducing and encouraging such shooting, and, moreover, of encouraging it directly upon sporting lines in the hope of popularising it by means of the British characteristic love of sport. In March, 1901, the late Sir Frank Green, the Lord Mayor of London, presided at a meeting at the Mansion House in which the objects and aims of the Society were announced, and a resolution calling the Society into existence was passed. Hitherto the work of the Society has been largely the development of suitable apparatus for short-range shooting, the dissemination of literature upon the subject of shooting appliances and generally instructive of the methods of form ing and managing shooting organisations. At the present time some 350 rifle clubs, having 30,000 members, are affiliated to the Society, and it cannot be doubted that its efforts have led to many thousands of young men learning something of shooting who would not otherwise have been able to do so, whilst it has laid the foundation of a permanent movement which has proved its vitality and is steadily developing. The experiences of the open competitions promoted by the Society and held at the Crystal Palace in 1903, and Olympia in 1904, indicated the necessity of devising regulations having for their object the establishment of some measure of uniformity in the power of ammunition, calibre of rifles, and other incidentals. In March, 1905, the Society promulgated the following regulations, indicating a policy sufficiently broad to avoid restrictive interference with the choice of clubs, in the matter of rifles, aiming devices, and ammunition, whilst affording scope for development and improvement and, so far as might be, achieving this object." (1) Miniature Rifle Clubs.—A miniature rifle club is a club which, being affiliated to the Society of Miniature Rifle Clubs, carries on rifle shooting wholly or partly with miniature rifles on miniature ranges with miniature ammunition, as defined in paragraphs 3 and 4. (2) Miniature Ranges.—A miniature range is a range not exceeding 100 yds. in length, upon which miniature rifles and ammunition, as defined in paragraphs 3 and 4, are used. (3) Rifles.—A miniature rifle may be of any pattern, single-loading or repeating, of any calibre not exceeding .23 of one inch or 6 mm. ; or, a rifle of larger calibre fitted with any device for firing miniature ammunition, as defined in paragraph 4. Sights may be of any pattern, fixed or adjustable, both vertically and laterally, but, in competitions promoted by the Society, rifles may not be fitted with magnifying glasses, telescopes, or spirit levels. A miniature pistol may be single-loading or repeating, with any sights as described for miniature rifles, and taking any miniature ammunition as defined in paragraph 4. (4) Ammunition.—A miniature cartridge may be rim fire or central fire, with projectile of any calibre not exceeding .23 of one inch or 6 mm., and, in case of bottle-shaped cartridges, the shells may not exceed .297 of one inch. The powder charge may not exceed 7 grains of black gun powder, or its equivalent in any other explosive. The projectile must be of lead, not cased with other metal, and not exceeding 50 grains avoirdupois in weight. (5) TARGETS .—TARGETS shall be of the following dimensions ; For shooting up to and including 25 yds., a card 6 in. square having ten rings, the central being half an inch in diameter and increasing by half-inches to 5 in. For 50yds., a card 12 in. square having ten rings, the central being 1 in. in diameter and increasing by one inch up to 10 in. For l00 yds., a card 21 in. square having ten rings, the central being 2 in. in diameter and increasing by two inches up to 20 in. (6) Scoring.—The score value of the central ring shall be 10, and of the other rings in a descending scale 9—8—7—6— 5 —4—3—2—1. The immediate effect has been to establish a marked increase in the use of 22-calibre rifles and ammunition, which appear to be well suited to the purpose. The adoption of aperture sights by many competitors seems to have favoured the attainment of higher scores, and gave rise to a request for the promotion of competitions in which rifles equipped with open sights only might be allowed—and this has been complied with. The Society was relieved of the necessity of providing especially for shooting with the Service rifle and reducing devices by the abundant encouragement extended to that method of instruction by the National Rifle Association. It has promoted nine open rifle meetings in London and the provinces, of which full particulars will be found on this and the following pages. The successful development of short-range, low-power shooting, hitherto comparatively unknown and unpractised in this country, is necessarily a somewhat difficult under- taking ; nevertheless, the experiences of the past five years are serving to provide the basis of a policy of progress, which has already raised the standard of low-power shooting to a high pitch of excellence, and so proving beyond question its utility as a means of teaching marksmanship. 20 YARDS. Bull's-eye 7/8in. in diameter, scoring 5 marks, with a central ring scoring 6 marks. Inner, 2 in. in diameter, scoring 4 marks. Magpie, 4 in. in diameter, scoring 3 marks. Outer scoring 2 marks ; remainder of target 6 in. square. Bull's-eye, scoring 5 points, 1-3/4 in. in diameter, having a central ring scoring 6 marks. Inner, scoring 4 points, 4 in. in diameter. Magpie, scoring 3 points, 8 in. in diameter. Outer, scoring 2 points ; remainder of target 12 in. square. Shooting was restricted to miniature rifles, or Service rifles with Morris tubes, the former not exceeding .23 calibre, weight 8 Ib., and a trigger pull minimum 4 Ib. Aperture sights and orthoptic spectacles were not permitted. At 20 yards shooting was done in the standing position, and at 50 yards in the prone, except in the championship competition, in which the kneeling position was also adopted. S.M.R.C. CHAMPIONSHIP. Individual entries open to all comers. Conditions.—FIRST STAGE : Seven shots standing, seven shots kneeling, and seven shots prone at 20 yards. SECOND STAGE.—Open to the makers of the 50 highest scores in the First Stage. Ten shots standing and 10 shots kneeling at 50 yards. THIiRD STAGE.—Open to the makers of the 20 highest aggregate scores in the First and Second Stages. Twenty shots prone at 50 yards at a target 8 in. square. A letter from Lord Roberts in 1906 to Hyam Marks, the Secretary of the Society of Miniature Rifle Clubs, congratulating the Society on the increase in number of affiliated clubs to over three hundred. 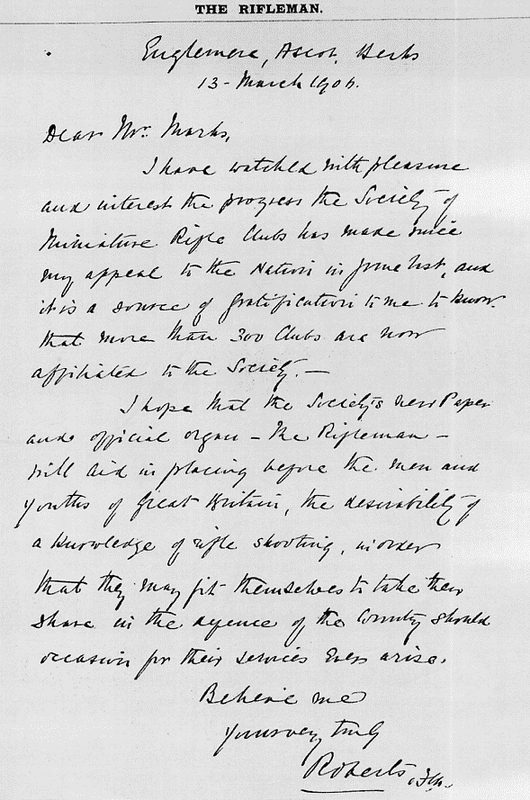 He also comments upon the commencement of the Society's new journal - The Rifleman - and hopes that the publicity will encourage the populace to take heed of his call, made the previous year, for the men of the Nation to acquire familiarity with the rifle and marksmanship in preparation for any opportunity or need that may arise for them to serve their country. 1. THAT the name of the Company be changed to "The National Small-bore Rifle Association." (a) Wherever the word "Society" appears substitute the word " Association." (b) In Clause 3 (i) (e) add the words " Ammunition, accessories to rifles and rifle ranges and ether shooting equipment." (c) Add a new paragraph 3. (i) (f) to read as follows : "To promote the establishment and maintenance in the United Kingdom of Great Britain and elsewhere of County, District, and other Associations or bodies, which in the opinion of the Association are or will be calculated to advance the objects for which the Association is established or some of them, and to contribute to the funds of or otherwise support and advance the activities of any such Association or bodies." (d) In Clause 4 substitute the words " l4th Section of the Companies Act 1929 " for the words " 21ist Section of the Companies Act 1862." (e) In the proviso to Clause 3 in the fifth line thereof delete the words "Managers or Trustees" and substitute the words " Members of the Council" and in the ninth and thirteenth lines thereof delete the words " Managers or Trustees " and substitute the word " Members." (f) In Clause 5 substitute the words " Section 18 of the Companies Act 1929" for the words " Section 23of the Companies Act 1867." (g) In the lines 4 and 14 of Clause 6 the words "of Management" shall be deleted. 3. THAT the regulations contained in the printed document laid before the Meeting and signed for identification by the Chairman be adopted as the Articles of Association of the Company. General Luard eventually found himself at odds with the S.M.R.C. 's chosen direction of disciplines, as explained by the following extract from a letter written, by Mr. E. Miller, to 'The Rifleman', and published in Autumn 2006, outlining articles from contemporary issues of the (then) SMRC's journal - The Rifleman. "He [Maj. Gen. Luard] had resigned as chairman of the executive committee [of the SMRC], a post he had held since the formation of the organisation five years earlier [The Rifleman issue.2, pg.2]. He resigned from the Council two years later, thus completely severing his connections with the organisation that he had founded as the Society of Working Men's Rifle Clubs (SWMRC) in 1901 [The Rifleman issue 488, pg.15]. He had become completely disillusioned by [what he deemed to be] the undue emphasis on deliberate "recumbent shooting" ( as prone was called at the time) against positional and snap shooting, which represented the conditions in the [military/battle] field and for which reason he had founded the SWMRC. A year after resigning from the committee, he set up the Patriotic Society which held shooting meetings at which rapid and positional shooting was emphasised. Following his tragic death in 1908, the Patriotic Society merged with the organisation (which, having merged with the British Rifle League in 1903, was now the Society of Miniature Rifle Clubs) bringing with it its trophies, the Patriotic shields, some of which are still in use today [ The rifleman issue 499, pg.5). It is worthwhile noting that involvement of working men's clubs in rifle shooting had preceded the S.W.M.R.C. by some years. In 1862, the Working Men's Club & Institute Union" had been brought into being by the Reverend Henry Solly, a minister of the Unitarian Church. The Union acquired support from many senior and famous members of society, notably Charles Darwin, Joseph Chamberlain, Gladstone, the Prince of Wales and notably also Queen Victoria. This union is still in existence, although one of its original aims - that of encouraging temperance amongst working men - is perhaps brought less to the fore nowadays. The Union promoted self-improvement, assisting with education of its members, and also encouraging the membership into all manner of sport and leisure activites. Athletics were then high in the unions sporting priorities (by the 1980s, darts, dominoes,snooker and billiards, cribbage, angling and bowls were the top six of the popularity list - in that order), but rifle shooting was given a worthy place in 1882-3, when Warren Hastings Sands established rifle shooting contests, for which Lord Brabazon gave a shield, and Lord Elcho assisted with the purchase of a massive silver trophy. The competition shot for this trophy was, in 1884, the International Volunteer Match, but is currently called the National Match - now shot between England, Scotland, Ireland, Wales and the Channel Islands. In years past, this trophy was held at the home of each winning nation; later it became one of those annually presented to the winners, then to the Lord Mayor of London for retention at the Mansion House for safekeeping. Over many years, this large National Match Trophy, intricately made by the famous silversmiths Elkington & Co., suffered many small incidences of damage and, after a significant refurbishment only a few years ago, it was decided that it should remain permanently on display at Bisley.The trophy now resides in the Museum of the National Rifle Association at Bisley Camp in Surrey (today the National Shooting Centre). The British N.R.A. was itself officially formed in 1860, its initial meeting being the famous Wimbledon event, of that year, at which Queen Victoria fired the first shot from a Whitworth rifle held in a cradle and triggered by means of a silk woven lanyard. Below: a representation of the occasion, portrayed on a contemporary food-paste ceramic pot lid. The very target, of cast iron, to this day stands prominently, more than six feet high, in the N.R.A. Museum. The central hit is clearly marked. Not small-bore related, but of great historic significance. Probably the most famous contribution to trophies for British competition rifle shooting was the shield also commissioned by Lord Elcho. A useful Chronology of the location of the SMRC Headquarters. 11 Queen Victoria Street, London E.C. These offices were bombed out by incendiaries on the night of 11th/12th May 1941 during the 'Blitz'. Many records and 41 challenge trophies were lost in the fire. Codrington House, 113, Southwark Street, London, S.E.1 N.B. the H.Q. has been named after the 'between the Wars' home of the SMRC. N.S.R.A. building, Lord Roberts House, Bisley Camp, Brookwood, Woking, Surrey, GU24 0NP The offices and shop of the N.S.R.A. for many years prior to the lastest new building. Lord Roberts House was sold to the Clay Pigeon Shooting Association and renamed Edmonton House. Lord Roberts Centre, Bisley Camp, Brookwood, Woking, Surrey, GU24 0PB Current residence of the National Small-bore Rifle Association ( N.S.R.A. ), which is part of the 10 and 50 metre ranges constructed for the Commonwealth Games of 2002.